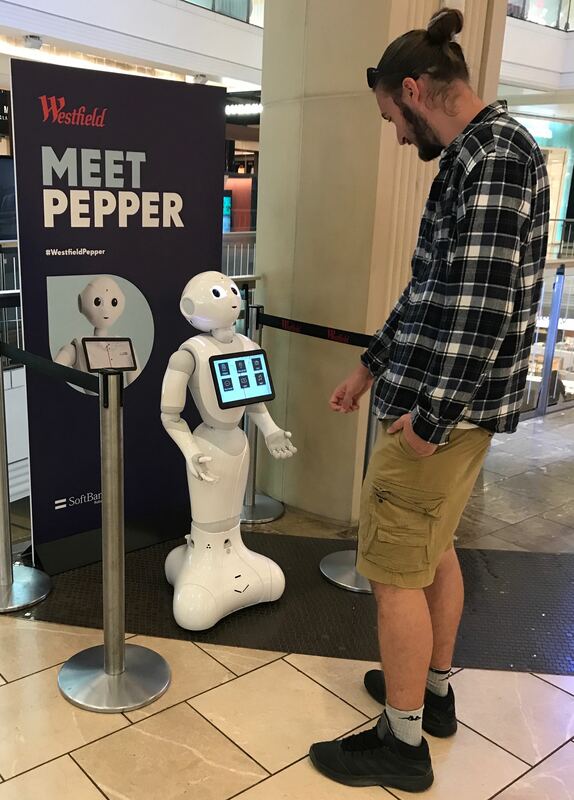 When visiting the vast Westfield Emporium in San Francisco last week I came across my first Pepper Robot. It was performing in front of an attentive young man in a cordoned off area next to an escalator. I watched their encounter unfold; the young chap followed the robot’s instructions to play a guessing game and after that join in creating some music. The chap seemed to be engrossed and did whatever Pepper asked him to do. Each time the chap responded Pepper became quite animated; its eyes and ears locking onto him and changing colour sporadically. The chap’s responses alternated between speaking, gesturing or touching Pepper’s ‘tummy tablet’ interface. Whilst talking to the chap, Pepper’s white plastic head also moved rather jerkily along with making various welcoming arm and hands movements. Both appeared to be enjoying themselves. After a further five minutes of interaction, the chap said goodbye to Pepper and I took my turn. I said hello to it and then selected various options from its tablet tummy as well as listening to its suggestions. This hybrid model of a talking, gesturing, child-sized robot that passers-by interact with by mirroring its actions or selecting options from a touch tablet display seems intuitive and an endearing way of communicating with a machine. Clearly, it is not trying to be like a human but has been designed to act like a robot with anthropomorphic qualities. I began by playing some imaginary music pads Pepper had laid out in front of me along to a piece of synthesized music. Pepper then played the mix back to me – but it did not sound that good. Then I tried the option of learning German. Pepper asked me to say, ‘guten Morgen’. When I pronounced this with gusto, it was very happy, rolling its eyes around and moving its arms up and down while flexing its potato peeler fingers. The Pepper robots have been around now for about a year and have found their home mainly in shopping malls, conference venues and showrooms. They started appearing first in Japan and now have reached the shores of the US and Europe. The reason retailers have got interested in them is for their potential marketing value: attracting shoppers back to the malls. It sends out the message loud and clear: come to our shopping mall and have fun. As well as playing games, the retail Pepper robots have been programmed to offer advice about the various stores, eating places and special offers. Behind me was a family, with two young boys, watching and waiting patiently to have their go. It seems like something that people from all walks of life will want to try out. Certainly, Pepper is a crowd-pleaser but not sure, however, of its crowd-pulling potential. I couldn’t see anyone going specially to the mall to be entertained by a Pepper and then going further into the mall to spend. But, then again, you never know, since I ended up buying a dress in one of the stores and having a nice lunch in the good court. Meanwhile, this year’s must-have Christmas toys have been predicted to be a life-like doll called Luvabella and a Lego robot controlled by an iPad. Presumably, the former is targeted at girls and the latter at boys (It does make cross that such blatant toy gender stereotyping continues well into the 21st century). Luvabella, however, is far from Pepper-cute looking. It looks more like a monster doll with huge blue eyes. And it makes disconcerting gurgling and kitten-like noises when you feed it plastic food, play peek-a-boo or give it a plastic toy to kiss. I have never heard a baby make noises like the ones Luvabella produces. There is not even an uncanny valley feel about it. I can’t imagine why any child would want to play with one. What’s more this kind of cringe-making, pretend like-like toy has been wheeled out before. Amazing Amanda came out five years ago and was equally sickly and did not sell well. The novelty wears of pretty quickly – and the play-acting that is offered is so contrived. Give me an interactive androgynous robot Pepper any day that is equally appealing and entertaining to kids of all ages and gender.